This modern construct, set among large rock outcroppings, rests just below Boulder's Blue Line, the highest allowable elevation for construction on the slopes above the city. Completed in 2008, the home was designed by NY-based architect Thomas Phifer, one of the world’s leading emerging architects. The house is conceived as a shimmering, faceted crystal emerging from the landscape. Says Phifer: 'We saw how glass has a wonderful quality to reflect nature, and we also saw this irregular shape as something that responded in an abstract way to the natural surroundings." The contemporary box boasts 11-foot ceilings, etched-glass walls and a massive, retractable skylight on the top floor. Steps lead from the detached two-car garage, covered with rusted raw steel doors, to the main level of the three-story, four-bedroom house, which maximizes natural light with glass curtain walls. Some inclusions on this level are an art gallery, a pet shower, and a 1,000-bottle wine cellar. The upper floor, which affords panoramic views in all directions, is a fully open plan containing the kitchen, dining, and living spaces. Boulder's stringent zoning code limits the amount of shadow cast by the house, which placed tight constraints on the overall volume. Seen from outside, the shading system will appear as a shimmering scrim with an ever-changing pattern altered by the owner's activity and whim. "When you move those shades, the character of the architecture will constantly change depending on the light, the shading, the time of year, and the amount of privacy the owners want," Phifer explains. As the design of the structure was intended to grow out of the site, proper landscaping was extremely important. R Design Land Architects took great care to restore the site's ecololgy back to its original state after constriction. Subtle stone terraces, staircases and boulders create functional spaces that blend into the character of this beautiful setting. The vegetation palette was matched to the surrounding foothills and changes drastically throughout the seasons. The fine detailing of a steel trough filled with crushed stone allows the vegetation to blend with the glass and allow drainage. Native buffalo grass was used as a central lawn area which sits on top of the garage. 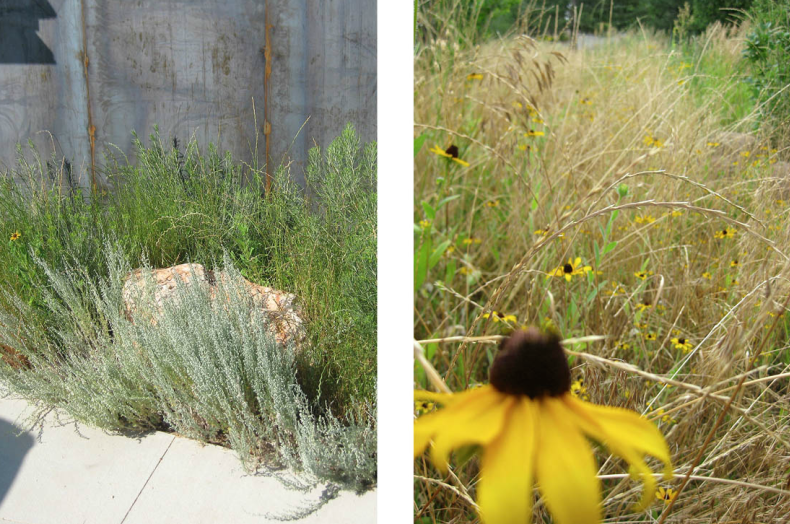 Local sandstone, native grasses, wildflowers, trees and shrubs were used to restore the site's heritage. 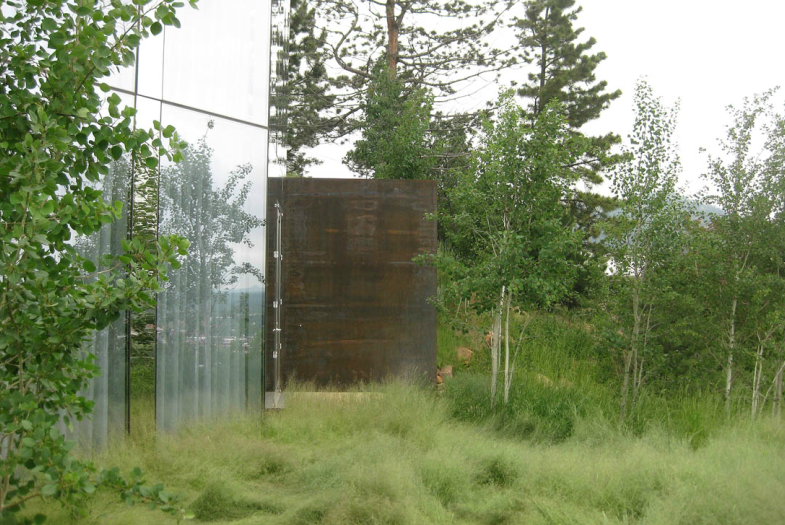 The house itself becomes part of its surroundings as it reflects the sky and the earth.